Just the right size to take a small shrubbery or larger pot plant, this 29cm tall illuminated flower pot displays your green fingered endeavours perfectly with a colour change light show. 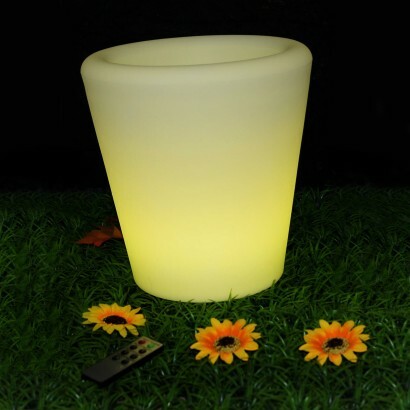 Ideal for use indoors and IP54 rated for outdoor use, this striking flower pot is perfect for brightening up patios and decking doubling up as subtle mood lighting on lazy summer evenings. Using the remote control, choose from colour change, hold on one of seven colours or simply go with the white candle mode to reflect your mood or the occasion.